We're setting the record straight on terror babies. That's the idea that terrorists come into this country to have a baby so the child can be raised and trained overseas to return to the U.S. many years later as a citizen and commit an act of terror. Texas State Representatives Debbie Riddle talked about it our program on August 10th. This week in another interview she tried to change the facts. By spending a few days here in America's fifth-largest city - which also happens to be at the heart of the nation's immigration debate - I had the chance to see this volatile issue from many different vantage points. But as far I know, I didn't see any terror babies. Regular viewers of CNN's "Anderson Cooper 360" will recognize that term as referring to children born on U.S. soil to illegal immigrants. The children are automatically granted U.S. citizenship under the 14th Amendment and then are smuggled back to their home countries to be raised as pint-sized, America-hating terrorists. Then decades later, when the children have grown into adults, they could easily - because of their U.S. citizenship - re-enter the United States to attack it from within. So terror babies are sort of like a sleeper cell, one that has to be put down for a nap every few hours or it gets fussy. Filed under: 360° Radar • Immigration • Opinion • Ruben Navarrette Jr.
Editor's Note: We have a Big 360° interview with country music star Trace Adkins tonight. He weighs in on Christine O'Donnell's recent victory in Delaware’s GOP Senate primary and Sarah Palin's presidential chances in 2012. 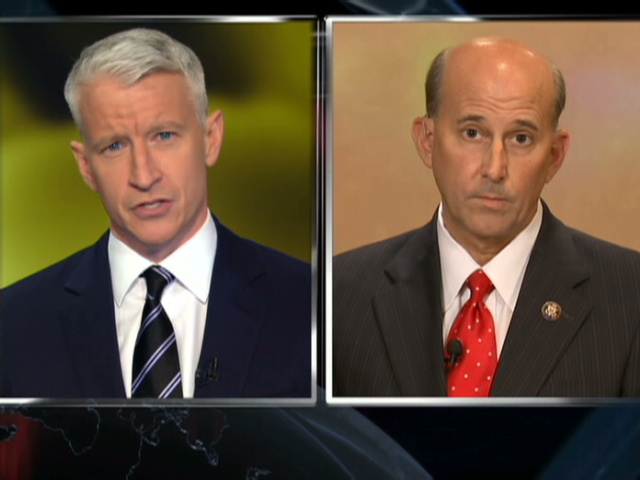 Join us tonight on AC360° at 10PM ET. "Wow. You’re almost as hairy as Khloe’s upper lip." "Oh, My God! That vintage dog handbag is soooooo chic!" Copiapo, Chile (CNN) - A bore hole reached 33 trapped Chilean miners Friday, officials said, but it must be widened before the miners can squeeze through - a process that should take a few weeks. The "Plan B" drill was welcomed by the jubilant workers as it reached its target in the mine's workshop, 623 meters (about 2,040 feet) down, at about 10:30 a.m. ET Friday, officials said. "Once we got back to drilling it went very good, the rock was real tough the last few hours, but we did it," said Brandon Fisher of Center Rock Inc.
Miners assisted the operation by offering guidance for the drilling. The workers could be rescued, if all goes well, in late October or early November. (CNN) – A spokesman for Republican Christine O'Donnell's Senate campaign is suggesting nothing improper was committed when it paid out funds to O'Donnell's mother, Carole, earlier this year. "Carole O'Donnell, Christine's mother, did receive money for her services rendered on accounting and the FEC reporting for the campaign before the treasurer came onto the campaign," a spokesman told CNN Friday. As first reported by The Daily Beast, records filed with the Federal Elections Commission show the campaign paid $3,500 to Carole O'Donnell between February and July of this year. The expenses are listed under "bookkeeping" and "financial consulting services." 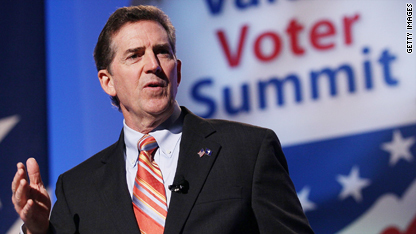 'Washington has treated Americans like they're stupid for too long,' Republican Sen. Jim DeMint of South Carolina said Friday at the Value Voters Summit. Washington (CNN) - Hotly energized social conservatives took aim at Washington's political establishment Friday, gathering to celebrate a string of GOP primary upsets this year and promising a revolution at the polls in November. Speaker after speaker slammed the Obama administration for advancing what was characterized as a left-wing agenda threatening to undermine the country's economy, security and moral foundation. The fifth annual Values Voters Summit, held in the nation's capital, is a veritable "who's who" of rising Republican stars and possible 2012 presidential contenders: Sens. Jim DeMint of South Carolina and Jim Inhofe of Oklahoma, Gov. Bob McDonnell of Virginia, former Arkansas Gov. Mike Huckabee, former Massachusetts Gov. Mitt Romney, Rep. Mike Pence of Indiana, Rep. Michele Bachmann of Minnesota and former House Speaker Newt Gingrich, among others. Also scheduled to appear at the two-day gathering is the right's newest celebrity, surprise Delaware GOP Senate nominee Christine O'Donnell. Reporter's Note: I’ve been fact-checking some political ads for lies and mischaracterizations, which is like checking a henhouse for eggs. You know you’re going to find something; just like the president finds my letter waiting every day. Related: Is new Angle ad beef or just bull?